The Below map is OUT OF STOCK. We will be launching our very own map in January 2019. 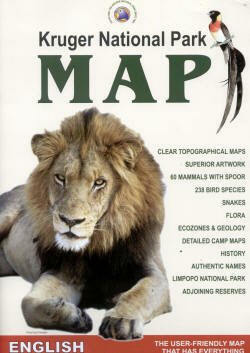 Explore the magnificence and glory of this pristine wilderness... Far more than a large scale map of the Kruger National Park... it's a 24 page beautifully illustrated complete guide to the fabulous Kruger. 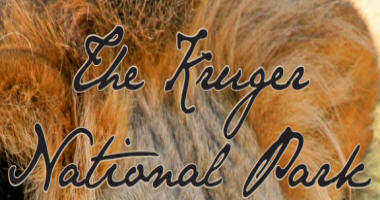 The Kruger National Park is a world icon and a South African treasure. Situated in the north east of South Africa and bordering Mozambique and Zimbabwe the Kruger stretches from Malelane in the south up to Pafuri gate in the north. It takes more than a day to travel from north to south along the main road at 50km per hour which is the maximum speed limit. There is a vast network of roads that transverse the park form north to south and east to west making it quite easy to spend a month in the Kruger in order to cover all the roads available. 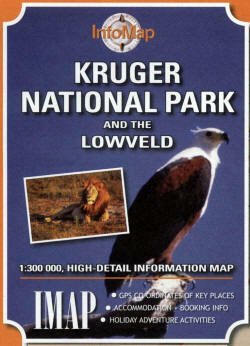 This map covers what is possibly the most exciting region within the whole of South Africa. About 250kms east of Johannesburg the road starts to wind its way down from the Highveld to the Lowveld. The drive is characterised by amazing changes in scenery, temperature and vegetation as the highveld becomes the lowveld... a frost free area bordering on the sub tropical. The road continues to the Mozambique border and thereon to the Indian Ocean. For more than any other reason the Lowveld is known best of all for the Kruger National park which sits on the north eastern edge of South Africa abutting both Mozambique and in the north Zimbabwe. But the Lowveld is more than the Kruger, it is an area of amazing natural beauty, rivers, waterfalls, forests and the oldest geological formations in the world. These ages old mountains are to found in the Barbeton area south of the administrative capital, Nelspruit. It was in the lowveld that gold was first discovered in South Africa in a place called Pilgrim's Rest... the town has been reconstructed to appear just as it did in the early gold rush days. GPS co-ordinates for a wide range of landmarks and intersections.